On 20 April in this calendar is the Dedication of the Cistercian abbey church of he Virgin Mary, Buckland ('Boclond'), Devon. 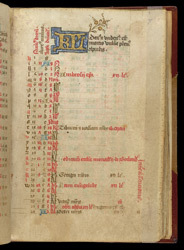 On 29 April (2nd line from the bottom) is the feastday of Robert, abbot of Molesmes, who was specially venerated by the Cistercians, and is therefore written as a 'red letter day'. The columns of numbers and letters to the left were used for calculating the dates of moveable feasts.